We're in the middle of a heatwave here in Estonia, and there's no end in sight. On the contrary, the weather forecast announces that the temperatures will soar even higher during the next few days. I'm not a hot weather person, and the heat has seriously affected my enthusiasm and ability to cook and stand by the stove. We've been eating sandwiches, tabbouleh, lots of hummus, and sugarsnap peas, carrots and radishes from our own garden. And this Danish dessert, koldskål. 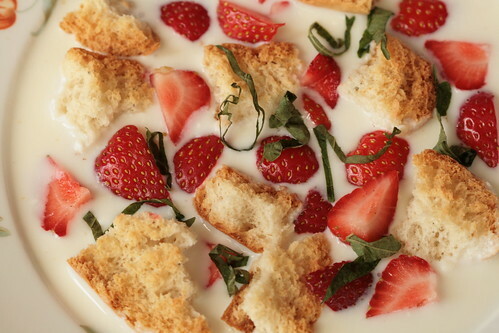 A great dessert to enjoy during those hot summer days. (There aren't many blog posts about koldskål, but you can check out Gitte's recent post. My favourite Danish foodblogger Zarah Maria, has only briefly mentioned this wonderful dessert). 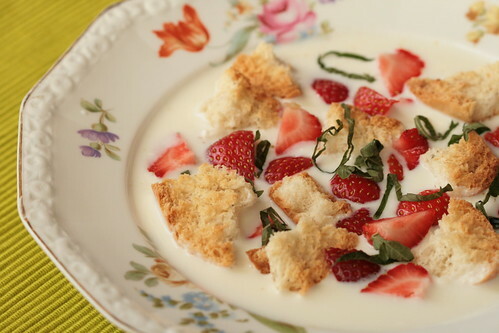 Combine sugar and yogurt in a bowl, stirring until sugar dissolves. Stir in the cordial and buttermilk, whisk until combined. If necessary, place to the fridge to cool. 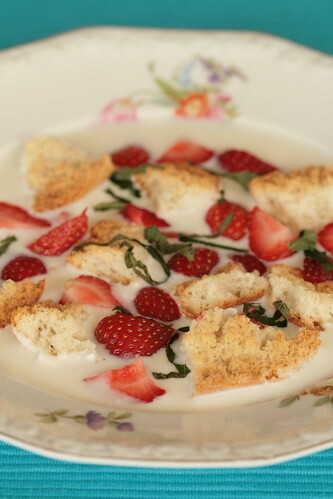 To serve, divide the koldskål into bowls, top with some biscuits and lots of strawberries. Garnish with mint or lemonbalm leaves and serve. Very interesting! Never seen this type of soup before. The soup is interesting - we like in Poland those kind of preparation. I even have 1 l of fresh buttermilk in my fridge (who does not have it in this country), some strawberries too, and still a bit of fresh mint...biscuits are somewhere here, too. It looks delicious! I'm sure it also tastes delicious. Texas is hot too. For dinner these days I am graving simple kefir mixed with fresh dill and some cucumber, salt and pepper. You could add more herbs and potentially garlic. I'll have to try this soon with elderflower--when I lived in Denmark, we always had the traditional egg/lemon type. Every year I wait for those too hot days, and we have it for supper. Here's a post and recipe from my blog. thanks for the sweet reminder of my danish childhood. love...koldskål! Love the addition of strawberries to your Koldskål, very beautiful. Thank you for linking to my page. I dont event want to wonder how it tastes..